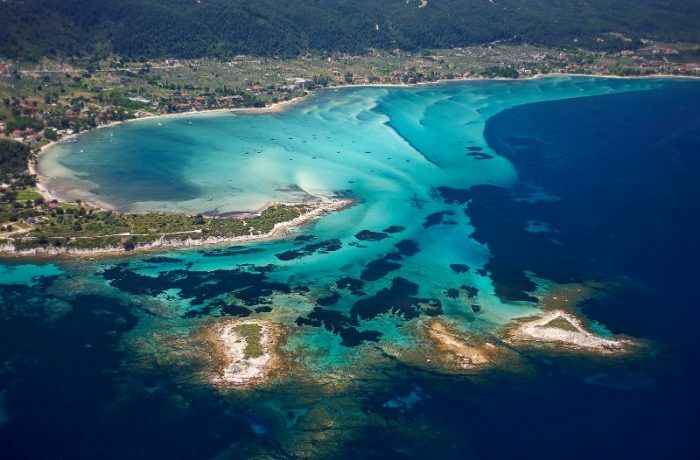 It is time to explore the Sithonia Peninsula with its stunning beaches, magnificent villages and mesmerizing forests! When leaving from Thessaloniki, 60km along the road, you will come to the junction that leads RIGHT to Sithonia and straight on to the Kasandra Peninsula. Turning right means embarking on a unique adventure through the culture and nature of Halkidiki. In just 4km you will see a sing for Agios Mamas, then a left turn to Olynthus (+2km) and a right turn for the prehistoric settlement of Agios Mamas (+1km). At Olynthus, you can visit the ancient city, which was the most important political and cultural center in Halkidiki during classical times. Once you drive through Kalyves, in 3km you will reach the Polygyros junction. The turn to the left will take you up to Polygyros, the administrative capital of Halkidiki (+12km) while the one to the right will lead you to the town’s harbor, Gerakini. You will see sings for Psakoudia, Ormylia and Metamorfosi and then reach Nikiti, which is the starting point for your tour of the peninsula. The next junction will be in about 2km and offer you different options for your Halkidiki adventure. To the RIGHT, the road will lead you to Neos Marmaras (+18km), Porto Carras (+20km) and Porto Koufo (+44km) while the road straight ahead will take you east to Agios Nikolaos (+8km), Vourvourou (+11km), Sarti (+40km) and Sykia (+51km). Your next destination is the bustling town of Neos Marmaras, where you can enjoy incredible leisure activities, discover local cuisine and unwind after months of hard work. About 5km outside of the town, you can drive uphill to the traditional village of Parthenonas, while just 2km of driving down the main road will lead you to the Porto Carras hotel complex, which covers an area of 18,000 hectares and offers visitors 10km of private beaches and 34 private harbors. The next part of your journey will sweep you off your feet thanks to the stunning natural scenery and incredible Mediterranean landscape. Indulge yourself in the magical natural beauty of Sithonia and enjoy the spine-tingling scenery with all your senses. A small sign will show you the way for the Tristinika beach, while carrying on along the main coast road will bring you to Toroni. The enchanting natural harbor of Porto Koufo is the next stop on your trip in just 2km. Another 11km along that beautiful coastal road will bring you to the sign for Kalamitsi, which is the gateway for the eastern side of the peninsula. After Kriaritsi and Klimataria, you will reach the Sykia beach, while the homonymous village is just 2km from the coast road. The humming town of Sarti is your next destination. During summertime, Sarti is one of the most popular tourist destinations in Halkidiki and it gets super-crowded. From now on the road runs through amazing pine forests, with dirt tracks turning off to magical little-known beaches, the hidden gems of Sithonia. As you approach Vourvourou, you will be flabbergasted by natural scenery of the exotic archipelago of nine islands. The picturesque harbor of Ormos Panagias, a popular departure spot for daily cruises around the peninsula is up next while the village of Agios Nikolaos, one of the oldest settlements in Halkidiki is just 3km down the road. Continuing the eastward route, you will pass the Salonikiou beach and arrive at Pyrgadikia, when you can take the road up into the mountainous area of Halkidiki, passing the villages of Mt. Holomontas. The distance to Arnea is 35km and the amazing landscape of Taxiarchis is just 16km down the road.